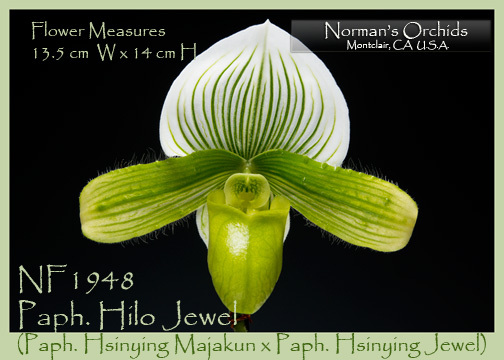 A beautiful result of mating two exceptional parents, Paph. 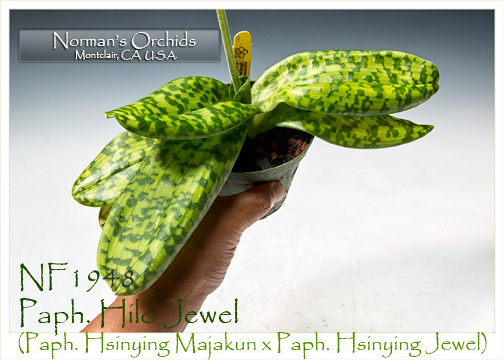 Hilo Jewel has been producing extremely handsome Maudiae-type flowers and is arguably one of the finest modern green Maudiae hybrids today. 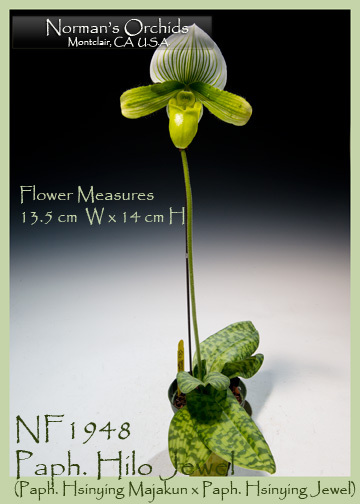 Expect its round broad flat white dorsal sepal to be marked with well-defined green stripes, the wide petals more heavily suffused green, some with delightfully contrasting white tips, and the pouch to be almost solid green. Produced on erect self-supporting spikes over beautifully patterned foliage, this is one of the best that we have seen from this type of breeding. Highly Recommended ! .